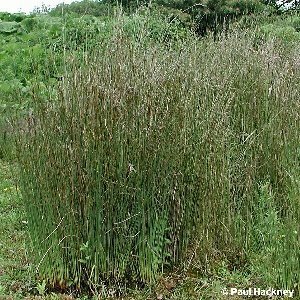 A tall, rather slender rush, reaching about 3 feet in height, with the rather diffuse tufts of brownish flowers produced a few inches below the stem tips. Leaves and stems are both circular in cross-section, with sharp points. 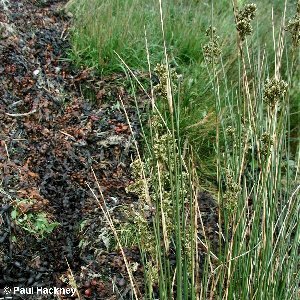 The stems are produced in clumps which can form dense stands. It is not uncommon in Co. Down on upper sea shores or in damp ground near the sea (such as about the Harbour Industrial Estate near Tillysburn) but is much rarer in the other two coastal counties. All names: Juncus maritimus Lam. 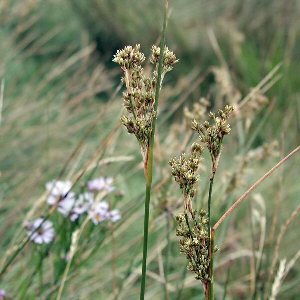 ; Juncus spinosus auct.